A man has been arrested on suspicion of murder by detectives investigating the disappearance of Sussex man Mark Manning today (Wednesday, May 6). The 38-year-old from Worthing is currently in custody awaiting questioning after he was detained by officers. Mr Manning, 54, of Brighton Road, Lancing, was last seen on April 19 2014 before his family reported him missing on 22 April. Officers launched a murder investigation last June. A year on and despite extensive proof of life enquiries and searches, no one has reported hearing from or seeing him. His body has not been found. 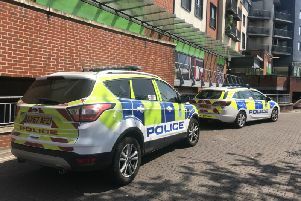 A number of police vehicles attended Becket Motors, in Littlehampton Road this morning and a tent was set up on the forecourt at around 10.30am. An eyewitness reported police driving a car parked on the forecourt away from the scene. The arrest follows last week’s search of Brooklands lake, after police received a tip-off suggesting Mr Manning’s body could be found there. Click here for the coverage.